This is made entirely from leftover items from Thanksgiving and some standard pantry items (at least mine). 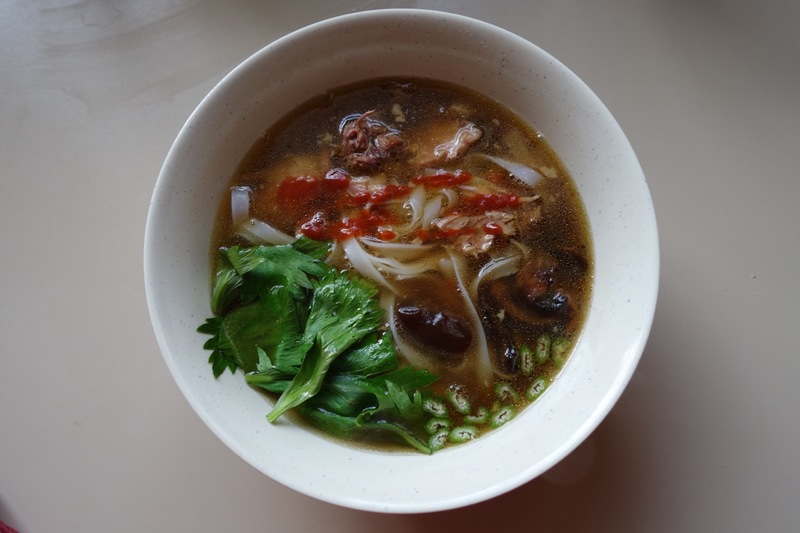 While I used mushrooms and celery leaves because that’s what I had, you should use whatever you have or just go traditional and pick up mung bean sprouts, jalapeno, and thai basil. And your turkey may not have been smoked like mine was, but that roast or fried turkey carcass will do just fine, though will lack the smokiness, obviously. Just be sure to pick parts of the carcass that have some meat still on it, like the wings, neck, and backside. You’ll be eating that in the soup when it’s assembled. I borrowed the spicing heavily from here. I mostly followed it for a beef version a few months ago, and that came out great, too. 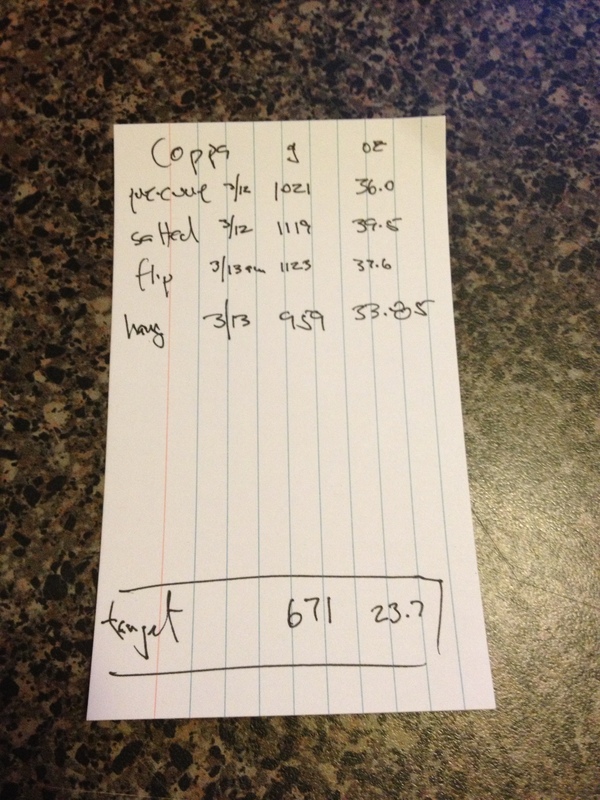 Oh, and I used a pressure cooker which is superior for stock making. If you don’t have one, I’m sure you could just simmer the broth for a few hours to mostly the same effect. But you should own a pressure cooker. Besides this, I’ll share the best reason to own one with a future post. Slice the onions in half and the ginger, too, lengthwise. Place under broiler till they’re nearly black. Put the ginger, onions, and rest of the broth ingredients into a pressure cooker. Fill pot with water to its fill line. Put on lid, bring to full pressure, and lower heat but still maintain pressure for an hour. After an hour, take off heat and let the pressure cooker lose pressure naturally. 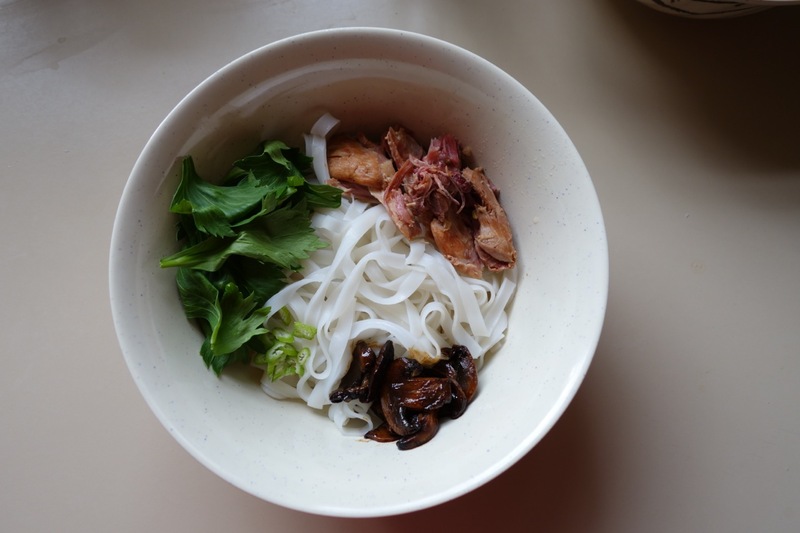 Soak the rice noodles for 10-20 minutes in hot water till soft. Drain. Once pressure is released on the pot, strain broth. Pick any meat you can from the spent bones. You should have at least enough for 4 bowls. Put broth back on the stove and bring to a boil. Assemble bowls with noodles, picked turkey, and the rest of your garnishes. Top with the heated broth. It’s all lead to this. Well, to be fair, the moment of truth is likely still close to two months away. I’ve long daydreamed of a simple life of working a modest pig and goat farm and producing artisan ham and goat cheese. And it’s always been a daydream, and it’s very likely to stay that way, but I’m at least a few steps closer to that ideal life. And it’s all thanks to a well prepared wedding registry and the generous folks on our invite list who have unknowingly been contributing to fueling that daydream. So, what are the magic items? A wine fridge with temp control and a copy of Michael Ruhlman’s and Brian Polcyn’s Salumi book. I’m certain that those that bought us the wine fridge – as any reasonable human being would – assumed it’ll be used to protect our extensive wine collection. Nope. After pulling out a bunch of the bottle racks and putting a pan of salted water in the bottom, I’ve hopefully recreated a temperature and humidity controlled environment in which to cure and age a variety of charcuterie and salumi (which by the way is the Italian word for all cured meat, not just salame) and maybe someday cheese. The process so far is pretty straightforward. 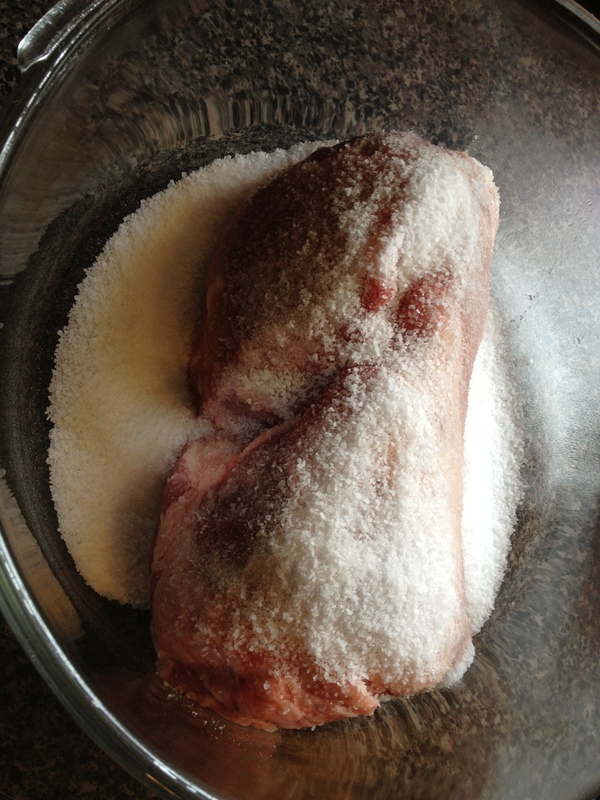 Salt the meat thoroughly and uniformly. Weight it down and leave it to cure for a day or two in the refrigerator. 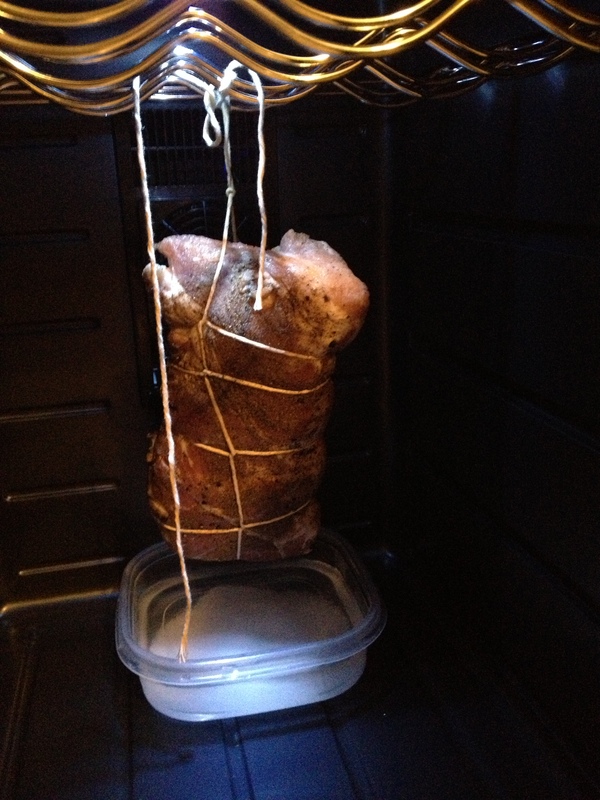 Once it’s been cured and the meat has tightened up some, it’s ready to hang in the “cave” or in this case, the wine fridge. Doneness is gauged entirely by weight loss. When it’s lost 30% of the its original weight, it’s done. And the waiting begins. Stay tuned. It came time to plan an outing for a milestone of a birthday, I started from a very short list. I first started with some regions and got it down to New Orleans, San Francisco and Napa, or New York. It didn’t take long to hone in on New York but still there was some more work to be done. I’ve always pined for a Thomas Keller meal, but Per Se and the French Laundry seem just out of reach for me. Three summers ago, I had one of my all-time favorite meals at Blue Hills at Stone Barns and have always imagined what they would do in different seasons, so this was the fallback plan. The backup plan if we weren’t able to secure reservations to a pretty new place called Blanca which sits in the ramshackle compound of Roberta’s a pizza place for those in the know out in Bushwick. And with a little bit of effort (none of my own doing, thanks to my companion who manned the phone) and luck we secured 2 of the 12 seats available for my birthday night. And for a month the anticipation grew and grew as I read the handful of reviews and reports from the past year since it opened. 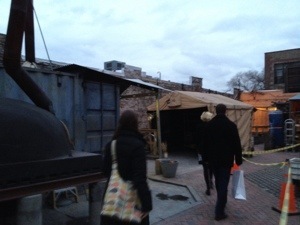 They ask that you check in at Roberta’s, then lead you through what looks like a cross between a construction zone and a junkyard. But then you arrive at a separate building that is at once austere, serene, yet fully comfortable. Clean, cream colored walls, cushy leather backed stools at the counter facing the steamy, smoky both hi- and low-tech (and always calm) kitchen, and Sticky Fingers blaring from the turntable. Then the relentless begins. I won’t even begin to describe every dish. I couldn’t if I tried. When trying to recount after the fact, at first I forgot some of my favorite dishes. That’ll happen when your head is swirling deep into a tasting menu of 25 or so courses that come like clockwork over the span of 3 hours. Oh, but before I mention a few of the dishes, let me mention the service. It was perfect. The right combination of attentive, informative, conversational, and absent. There and helpful when you need them, and helping someone else when you don’t. Like a great host at a party. The service really is part of the whole package, creating a really relaxed and fun environment. But now back to the menu highlights. It started with a slew of seafood dishes including a plate of 5 different raw preparations, each one better than the next. Needlefish, geoduck, herring, horse mackerel, and sea perch, each with their own garnish. A real microcosm of what the kitchen excels at. There were lightly breaded and fried veal sweetbreads with lime that were definitely the best sweetbread preparation I’ve ever had. Deep in my memory banks, I’m recalling perfectly tender squid, though I’d be hard-pressed to remember what else was on the plate. Shortly after that there was possibly my favorite savory dish of the night, thinly sliced strips of barely grilled Wagyu in a sweet kohlrabi broth that reminded me of sukiyaki. The paper thin, fatty beef literally melts in your mouth as you eat it. At some point deep in the middle of the evening we were presented with the simplest presentation of the night. A giant king crab leg still in its shell and a large dollop of plankton butter. And a hot towel to clean up with. A perfect dish for a kitchen that tries (and succeeds) so hard to present the most elegant and exquisite dishes and plates and presents them in the least stuffy way possible. There was a string of pasta dishes, including hand-rolled pici with squab and a single ravioli filled with nduja – a spreadable spicy salami. There was a course that was just bread and butter. But of course, it was 4 different breads and homemade butter. After about 15 courses, I thought this was going to be the end of me, but it actually invigorated me for the home stretch. In between some key transitional courses, there were some palate cleansing sorbets and granitas. Most notably, a celeriac gelato with lime gelee that tasted exactly as you’d expect and want. And a buttermilk sorbet with Meyer lemon marmalade. For the meat courses, there was a chicken dish that we watched all night as the whole bird – head and feet included – spun around in the oven for an hour, then was grilled on a yakitori grill – meat and skin separately and served on polenta. Obviously, the skin was the best part. And then another Wagyu dish for the ages. Aged New York strip cooked rare and sliced, served with radish, and a sauce enriched with melted beef fat. Finally dessert was the real surprise of the night. Following a cheese course of runny La Tur atop a lemon jelly, there were just a couple of similarly presented dishes but they might have been two of the strongest dishes of the night. The first is a contender for my all-time favorite dessert and absolutely one of my favorite dishes of the night. An orange sorbet sat atop a rye “foam” that reminded me of a zabaglione with crunchy rye berries sprinkled on top and a surprise dollop of caramel along the bottom. Totally amazing and wholly new. This was followed by an almost equally strong dish of apple ice with a thick sunchoke puree, dehydrated sunchoke chips, and some sort of sunchoke dust. Both desserts were complex, not single-note sweet, and completely unlike anything you’ve ever had before. So I enter a new chapter of my life noted arbitrarily by the calendar, I am thoroughly nourished and possibly changed forever by this meal, now more than 24 hours and a so-so night’s sleep in the past, that still has my head spinning trying to figure it all out. I’m also lucky to live in a neighborhood full of creative people who care about their neighbors and this community. One such example is the Empty House Studio, a temporary space for artists to create and share. 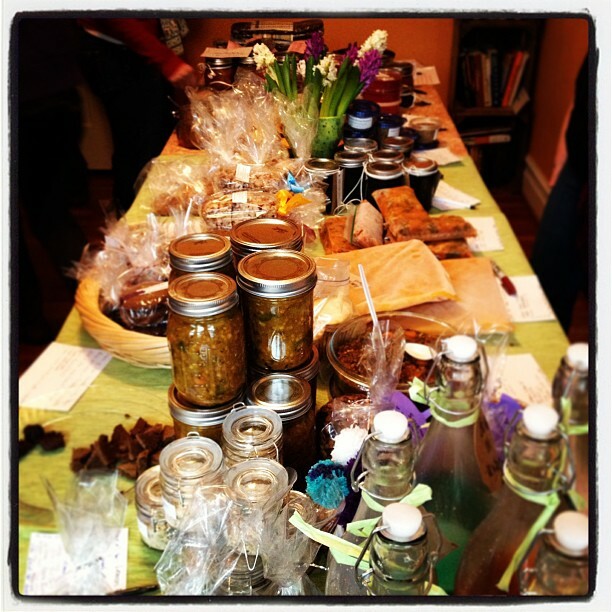 Well, this past weekend they hosted a neighborhood food swap organized by the folks at DIY Del Ray, a blog written by some other neighbors that focuses on all sorts of neighborhoody and non-neighborhoody things alike. Being wholeheartedly committed to the DIY food movement (as readers of this blog will no doubt recognize), I was excited to finally participate in one DIYDR’s regularly scheduled events. If you’ve not been to a food swap before (and I had not), here’s basically how it works. Bring any number of things you want to share and swap. Check out what everyone else brought and decide what you’d like to trade for. (But remember, you can only trade as much as you brought.) And then let the swapping commence in fairly informal fashion as you meet the producers and negotiate your deals. My betrothed and I came prepared with loaded rice krispie treats, a boxful of canned pickles from the summer, and crusty rolls (using the no-knead recipe from Jim Leahy’s book) to swap. And we left with a boatload of stuff in exchange. It seems we have a lot of similarly minded neighbors creating some unbelievable stuff. I was blown away by the diversity of what people brought. There were even some local sponsors – neighbors who have their own cake and fermented pickle businesses. Here’s a list of some of the most impressive stuff, a lot of which we came home with. And there was so much more. There was so much stuff that we were looking for any flat surface for display of everyone’s goods. Besides our bounty, it was also great to meet a lot of unfamiliar faces that make up this great neighborhood. It was just an excellent way to spend a Saturday afternoon. Can’t wait for the next one. Sick of turkey yet? Chances are good you’ve gotten through all of your thanksgiving leftovers by now, but if you were smart, you saved that carcass. And there’s still plenty of goodness to mine from that pile of bones. I made gumbo sometime over the summer, so already had a bunch of foundational items leftover in the freezer. But I’d say some of these are optional, but also mostly easily procured at your grocery. When summer was still on and okra prices were as a low as a dollar a pound, I blanched and froze a couple of quarts of them to eventually end up in a gumbo sometime over the winter. After stockpiling shrimp shells for the better part of a year last year, I also had an ample supply of shrimp stock made from boiling the shells from about 2 pounds of shrimp for more than half and hour. And I still had one lonely andouille link leftover from the first go-round. I even had some leftover pickled shrimp from thanksgiving that ended up in the pot. But back to that turkey carcass. And a bag full of vegetable scraps – mostly celery, onion, parsnips, and parsley, again leftover from the many thanksgiving sides we prepared. Besides being the base for a ton of stock, you’ll also be surprised how much meat you’ll end up with when your stock is done. Brown the bones, skin, and other turkey scraps in your largest stock pot. Throw in your vegetable scraps and cover with water. I used close to 15 quarts of water that reduced by a couple of quarts by the end. Simmer – somewhere between 180 and 200 degrees – for a long time. I went about 5 hours because I still had dinner to make, but you could go for much longer. Strain it with a fine mesh strainer and strip the bones of all its meat. I ended up with nearly 2 pounds. But, now onto the gumbo. First off, get a roux going. Equal parts fat and flour that cooks for a while and takes on glorious colors and flavors. I used about 4 tablespoons each of bacon grease and flour and cooked this very slowly for about half an hour, stirring very often. But you could and should go much longer and darker than I did. Then add your stocks and any additional spices (i.e. Old Bay, file gumbo, pimenton, cayenne) and boil for a while till it thickens, at least another 30 minutes. Make sure to whisk in all of that roux. Once it’s thickened up, start adding all of your remaining ingredients – shredded turkey, shrimp, andouille, okra, and anything else you got laying around that might be good in that pot. 5-10 minutes later when your shrimp is cooked and everything is heated through, the gumbo is ready. Make a roux. Over low to medium low heat whisk the flour into your hot fat. Stirring often, cook for at least 30 minutes until the roux darkens. The darker the better, but don’t burn it. Turn the heat up to medium high and whisk in all of the stock and boil it till it thickens. At least 30 minutes. Once your stock is to the desired thickness, turn down the heat to a simmer and throw in the remaining ingredients to cook or heat through, another 5-10 minutes. Some secrets I like to keep to myself, but some are eventually revealed despite my best efforts. Dan O’Brien chef/owner of Seasonal Pantry was recently unveiled as a cheftestant on the upcoming season of Top Chef Seattle, so it’s only a matter of time before the rest of the city – and probably the country – catches on to what’s been quietly going down in the transformative Shaw neighborhood for the last year or so. By day, Dan and his tiny staff are peddling all sorts of handmade goods like pasta, sauces, jams, flavored salts, you name it out of a tiny little storefront. By night, the Seasonal Pantry crew transforms the small space into a dinner party for 12. And a dinner party that is ultimately more than just the sum of its parts. Here’s how this works. Every couple of weeks, Dan comes up with a new multiple course menu that’s usually based around what’s seasonally available, but there’s often also some sort of theme. The menu gets posted on the site and the scramble for the limited available seats begins. It does require at least a modicum of planning – basically remembering when “tickets” go on sale, usually about 2 weeks ahead of time. The whole night will cost you less than $100 for more food than you should be eating, a few glasses of something delicious and alcoholic, and that’s it – tip and tax essentially all included. A scream of a deal when you think about it. On the night of, show up just before 8, and if you haven’t bought out the whole table with your friends, you’ll introduce yourself to bunch of other like-minded, adventurous food-people that will be your companions for a fun and filling night. And, honestly, a lot of the fun is the fact that you’re having dinner with a bunch of strangers. I’ve met some really interesting folks with some really interesting stories. That would be great and all on its own, but if the food Dan and his assistant are serving wasn’t any good, it’d all be for naught. The first night we went, the main attraction was fried chicken. But, to be honest, I thought the chicken, albeit really good, wasn’t the best dish of the night. The sides that accompanied that course were amazing, all of it served family style. A summery succotash-like salad, corn pudding, and deeply flavorful baked beans stole the show of the course. But, I’ve skipped to the end on you. Preceding all of this were some of the tastiest devil eggs I’ve had, a pimento cheese and salad that changed my perception of pimento cheese. Continuing the southern theme, there was a delicious dirty rice with generous amounts of crab and shrimp. All of this accompanied by a lethal punch flavored with peaches, vanilla, and sparkling wine that might just have been the best thing of the night. No one left hungry, and there were mounds of leftovers. A magnificent introduction to the supper club phenomenon. The second and more recent time we went, the menu on paper looked just about perfect to me. But, here’s the fun part of it. The menu is really just a list of ingredients for each course. The surprise is what Dan is going to actually serve for each course. How are those ingredients going to come together? First out was “Egg, mushroom, oyster, bacon.” Pretty much 4 of my favorite things. What came out was probably the best thing I’ve had there. Crispy oyster mushrooms, a couple of lardons of really good bacon, a creamy, earthy, and briny sauce made of oysters, all topped with a slightly runny omelette. I seemed to be the last one finished each course, but I lingered with this one possibly a little too long, as Dan asked if I was intending on licking the bowl before he cleared it away. Next out was an ingenious squash soup. On the surface, it looked pretty straightforward – dark orange with a dollop of creme freche. But what lurked along the bottom of the bowl was a brown sugar custard that you scooped at to raise the sweetness of the soup. Crazily creative, but also crazy good. Third course was a pasta – small sheets of pasta, wrapped around a simple ricotta filling with the ends twisted so it looked like a caramel candy. Accompanied by a sauce featuring bits of salami, again, a dish totally up my alley. Next up was a dish I think Dan ought to start offering up at the market for take out. These would kill. A steamed, slightly sweet brioche bun filled with braised chicken thighs in a spicy sauce flavored with Dr. Pepper and chiles. Imagine something like a steamed bao. It was about half through stuffing this bun in face that I started to realize just how full I was. But, to hell with it, there are two more courses! Course five was a pretty traditional braciole in a brightly flavored tomato sauce. Really good. Just wish I could’ve eaten more of it. At this point, I did something I rarely do – throw in the towel and leave my plate unfinished. Well, at least until dessert showed up – a small cake with pluots and sabayon. As you can see, there are so many reasons why this experience is so special. The hands-on service, the camaraderie of total strangers, the seemingly endless stream of imaginative and delicious dishes. And the menu’s just keep getting more and more imaginative. I’m already thinking about the next one. And while I wish Dan all the luck and success he deserves, a part of me is feeling just a little bit selfish and wishing the supper club could just be our little secret. Nose-to-tail, the tradition of using the entirety of a slaughtered animal is nothing new. Nor is the frugal nature of the home cook (which I strive to be) who makes the most of everything they can. But this technique was completely new to me. Taking the scraps from a peach canning project that were destined for the compost (or worse, trash can) and turning them into utter indulgence is a thing of beauty. Last weekend, we headed to our favorite u-pick farm to get a mess load of peaches to last us through the year until next peach season. A bushel or about 50 pounds, doubling last year’s half-bushel. About 25 pounds of those peaches ended up in quart jars – 11 to be exact. And if you’ve ever canned peaches before, you know the best way to do it is to quickly blanch and peel them. Well, 25 pounds of peaches begat about 5 pounds of peels. Well, not exactly. But you try peeling 25 pounds of peaches in one shot. By the end, you too might start using a knife on the tough-to-peel ones and end up with a little bit of flesh attached to those peels. 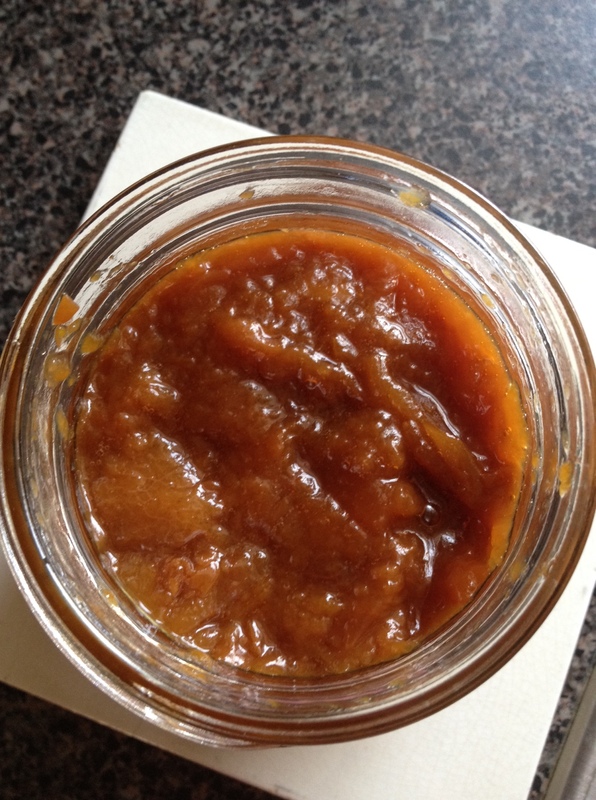 Five pounds is a lot of anything just to throw away, so thanks to the peach peel butter recipe, that 25 pounds of peaches that begat 5 pounds of peels (and some sugar and time) begat another 7 cups of a beautiful amber, slightly sweet peach butter that is a thing of beauty. Note, there’s no actual butter in a fruit butter. 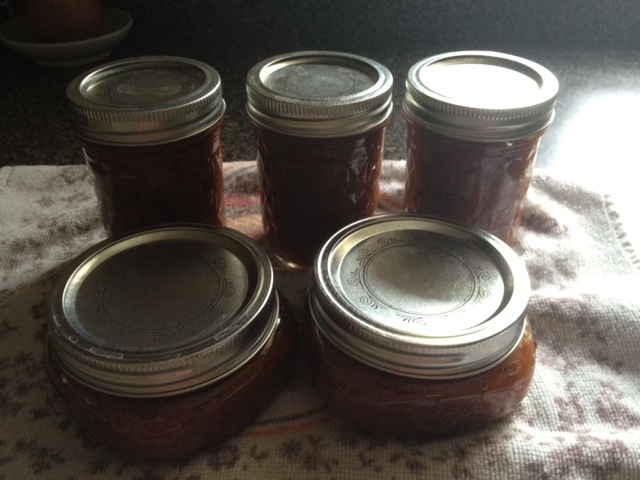 I imagine you could turn this into jam with some pectin, but I’m happy with what I’ve got. I tweaked a few things with the original recipe. I used much less sugar. To the 5 pounds of peels, I added about 2 1/2 pounds of sugar. And I used a 1/2 teaspoon of citric acid, because I didn’t have any lemons, and because, well, I have citric acid. I then simmered this for 8 hours till it all broke down. A full work day. I put it on the stove at the beginning of my work-from-home day, stirring and tasting every once and while, and took it off the heat at the end of my day. (I’d guess you could probably use a slow-cooker instead of the stove.) I ended up with 7 cups, 5 of which went into 8 oz. jelly jars to be processed in a water bath for 10 minutes. (The Ball Book lists 10 minute processing time for their fruit butters, so I’ll take the chance.) The other 2 went straight into a pint jar for the fridge. Imagine this stuff on ice cream or in or on a pie or on toast or just from a spoon straight from the jar. Good stuff. So, there you have it, real pit-to-peel cooking. With a new car in the driveway, a beautiful Saturday, and nothing to do, a drive out in the country makes perfect sense. I was already familiar with this quaint Virginia town, as I’d been to Trummer’s on Main a couple of times before. This beautiful restaurant out in Clifton, VA is definitely a destination restaurant for any of us in the city who want to get out into some peace and quiet. The dining room itself is a spectacle – bright with high ceilings and full of windows. The kitchen is sending out some really nice food that’s mostly seasonal and slightly risky. And you can’t beat the deal on Sunday where you help them drain their open wine bottles from the weekend for $5 glass and eat off the reasonably priced 3-course prix fixe menu. 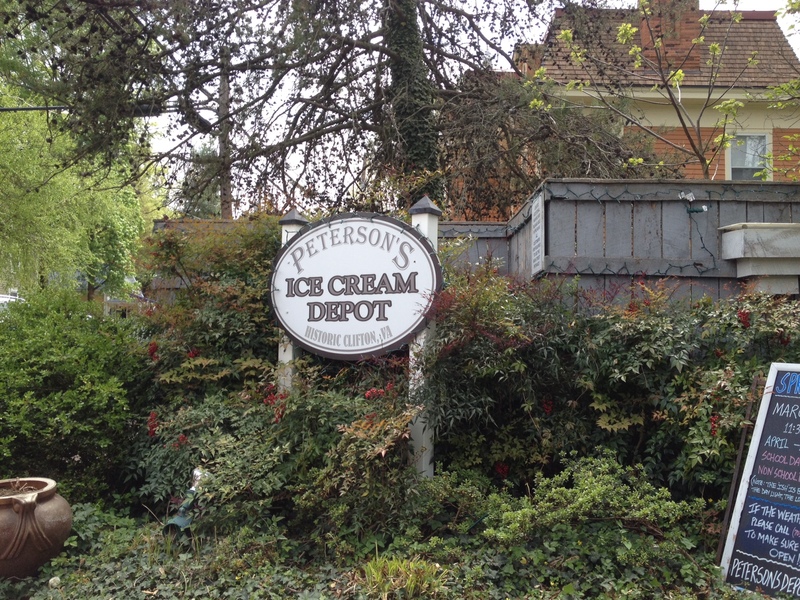 But it was the promise of chili dogs and ice cream (two of my most favorite things) at Peterson’s Ice Cream Depot that sealed the deal. 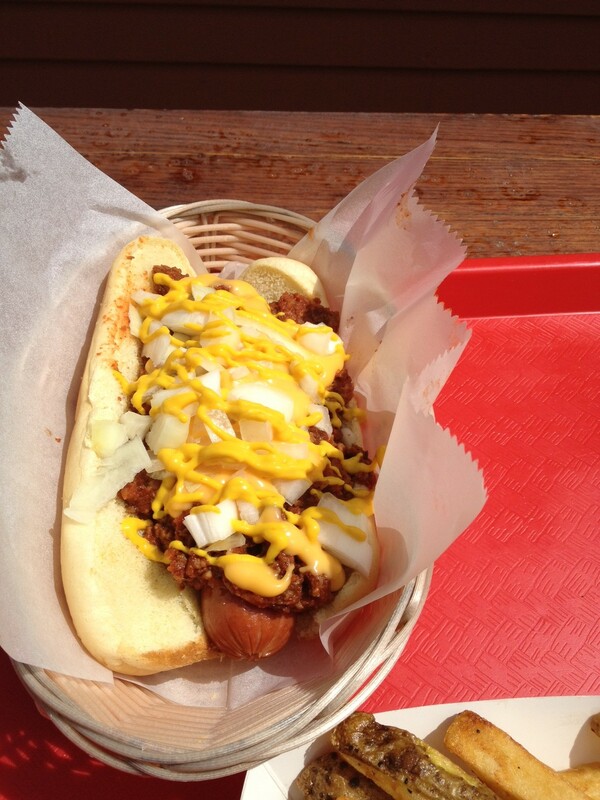 I’ll be honest right up front – neither the chili dogs nor ice cream were that amazing (though they do lay claim to the Best Ice Cream award in Northern VA,) but much like what they say about pizza – there are no bad chili dogs or ice cream. They were totally satisfying, and pretty much dirt cheap. But this place isn’t really about the food. What makes this place so special is everything else. First, it’s set back from Main St Clifton and shielded by trees and shrubs just enough that it feels like you’re in someone’s backyard. And pretty much you are. The set up is basically an old house. 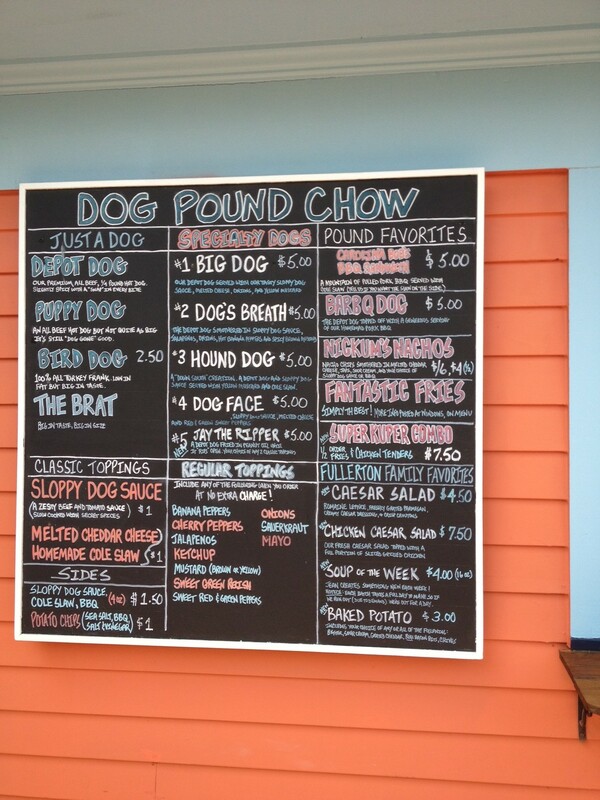 When you walk into the patio, you’re met with large chalkboards touting the menus – hot dogs of all sizes and toppings, ice cream, sundaes, shakes, pretty much any delivery mechanism possible for ice cream. And while their ice cream menu isn’t that deep – softserve chocolate, vanilla, and one flavor of the day, the options are still seemingly endless. Order at one window, pick up at another, and then take a seat either at the outdoor bar around back or at any of the various benches, adirondack, or lawn chairs scattered throughout the property. On a Saturday, the action is non-stop. City slickers from out east, families and their soccer playing kids loading up on calories after the game, local teenagers. And even though it’s pretty busy, the lines move fast and the atmosphere is that of a neighborhood block party. So, if you’re looking for a reason to get out of the city for a couple of hours, set the GPS for Clifton, VA. The drive’ll take you through some nice rolling backroads, and at the end of the drive you’ll find the promise of chili dogs and ice cream. What could be better? Throw in a stop at the Paradise Springs Winery a vineyard with an expansive lodge at the end of a deadend street not far from DT Clifton and you’ve made a day of it. While gathering ingredients for some homemade summer rolls (another story unto itself, I suppose,) I procured the most seemingly innocent bunch of fresh mint at my local market. When I got it home, I unpacked the bunch for washing and discovered this tiny looking bunch ended up being about 10 cups worth. As I really only needed about 2-3 sprigs for the summer rolls we were making for the next few nights, that means I had the rest of the bunch to use up. My first thought was for a basic mint pesto (throw in some walnuts, a little oil, some citrus and whizz it up) but then my mind immediately went to a more obvious pairing (and one which I already had everything I needed in the pantry) – pea and mint dip. Dip chips, vegetables, a spoon. This stuff is way tasty and will go fast. add everything in a blender (or use a hand-blender) and salt to season and blend. Add just enough water to help with blending and to get the right consistency. The resulting dip should be smooth and of hummus consistency. The next application was probably the most satisfying in its results. Again, my mind started in one direction, then immediately went in another. When I think of fresh mint, I mostly think of it steeped in milk for 10 minutes or so and then used as a basis for ice cream. But, honestly, I didn’t feel prepared to make any ice cream, so instead, I packed up a small food processor with as many mint leaves as it would hold, then covered with sugar, and processed for 60-90 seconds. Wowee! The sugar tastes undeniably of mint and will end up infusing all sorts of true mint flavor in a number of applications, but probably a whole mess of ice cream. pack a food processor with fresh mint, top off with sugar and process till mint is well distributed in the sugar. From here it was another obvious leap to create another flavor infuser, namely some mint extract. Most flavoring extracts are alcohol based, so another real simple “recipe” here. Your average 2 oz. bottle of mint extract costs at least $5. I’ll end up with about 8 oz. and it’ll cost me about 50¢. Take some mint, through it in jar, cover with alcohol, and let it steep for a few weeks. Up to you whether you want to leave the mint in after the few weeks or not. I ended up emptying a bunch of old bottles of rum and vodka I had laying around. Again, this is all about getting some fresh mint flavor injected in all sorts of things. But, probably a whole mess of ice cream. pack the mint leaves into a clean glass jar. cover with the alcohol and let it steep for a few weeks. My beloved and I have developed a bit of a Valentine’s Day tradition. Either on the day, but typically a weekend day shortly before, we forego the usual formalities of a hard-to-get dinner reservation (which are also often crowded and disappointing) and plan and prepare our own elaborate meal. 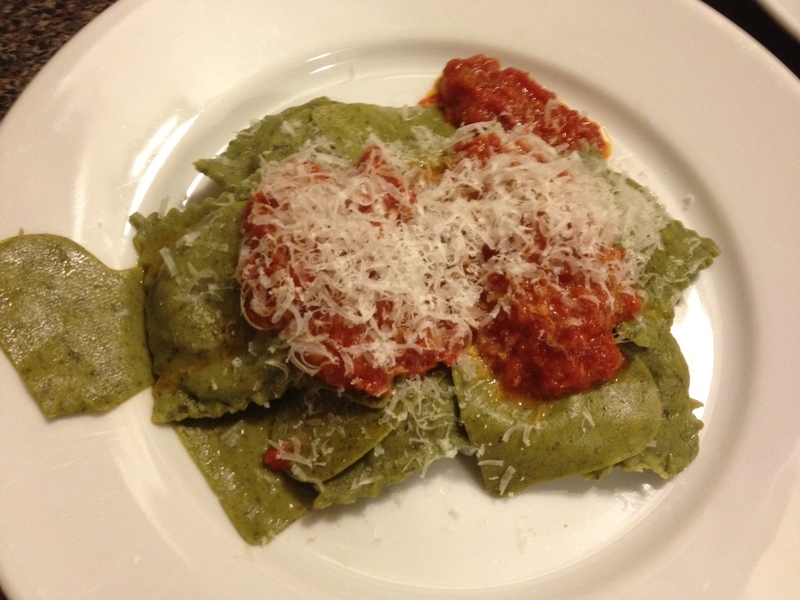 And there is one course that appears every year – ravioli. With a few years under our belts, experience and creativity are on our sides, so the ravioli course while a constant, is also constantly changing from year to year. Accompanying this year’s ravioli were a first course of La Tur – a soft, buttery mixed-milk cheese – with homemade quince paste and crusty no-knead bread. Next was a mussel and winter root vegetable soup enriched with bacon fat. Dessert was fudgy, from scratch brownies with raspberry frozen custard from our our neighborhood scoop-shop, the Dairy Godmother. But, ok, the real reason we’re here is to talk about ravioli. 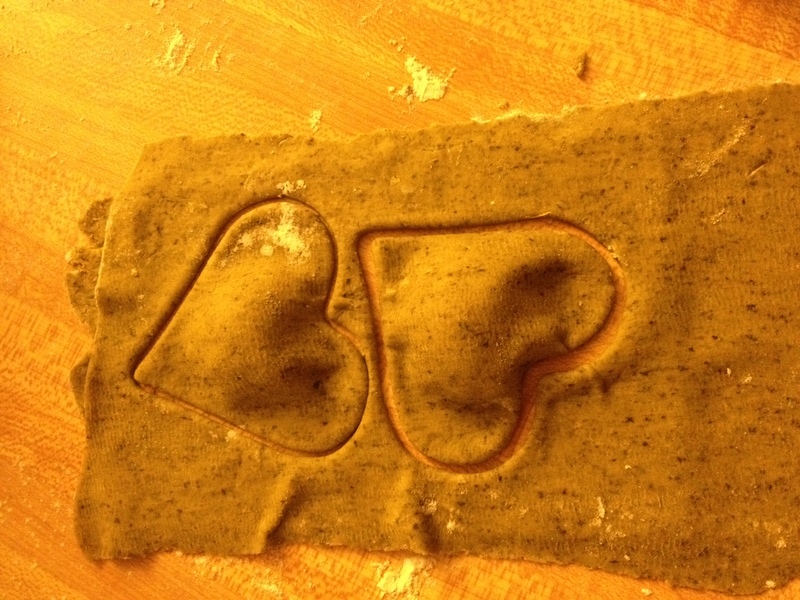 For the last several years, we’ve been using various round, square, and of-course, heart-shaped cookie cutters to form our ravioli. 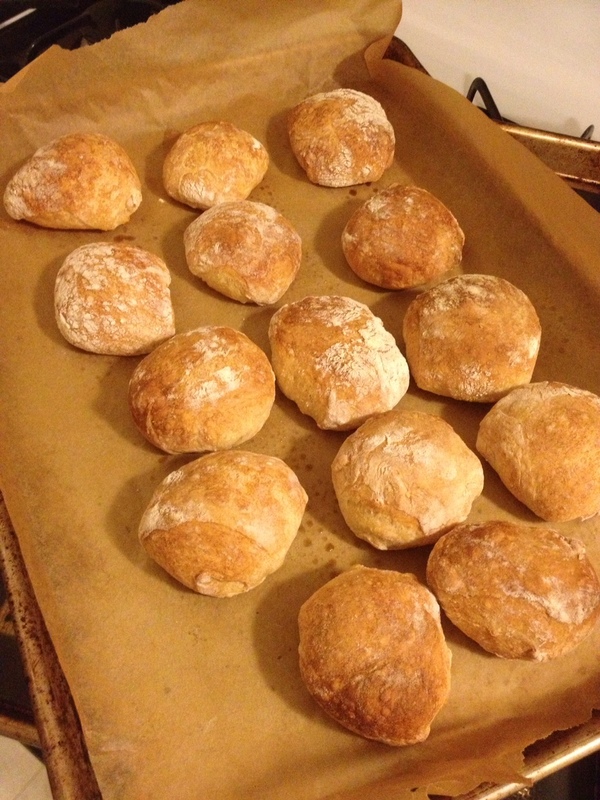 And the results, while really good and satisfying, have been, well, maybe a little amateurish, admittedly. So, in an attempt to up the ante, we splurged for a ravioli maker to add a little legitimacy to this operation. In the weeks leading up to the dinner, ideas are thrown out regarding what we’ll do this year. I wanted to try a flavored pasta, so I proposed using kale as a base. Then, as we contemplated a sauce, we naturally tended toward something smokey and porky. And then, as if it were staring us right in the face, we thought, “what if we put bacon on the inside of the ravs?” And so it was decided. And this was no ordinary bacon. This was Benton’s bacon, one of the best bacons around from Tennessee that we smuggled back from a recent trip to New York City. Seriously, this stuff is just about the pinnacle of all bacon, but that’s another story. The operation was pretty simple and along with our new fangled ravioli press, we also employed a food processor for the first time in our dough making. It all just came together relatively quickly. The only laborious part being the rolling of the dough. The end result was by far our finest performance. Not just uniformly shaped and filled, but the filling was simple, but fluffy and exquisitely bacon-y. After they were filled and boiled, we sauced them with some rich tomato sauce that was leftover from the summer that reduced on the stove slowly for several hours. Remove and discard the stems of the kale, and cook the leaves in a about 1/4 c. of water in a covered pot until they’re tender – about 20-30 minutes. Squeeze all of the liquid from the kale and let it cool. You’ll end up with about a cup. In a food processor, chop the kale and add the eggs and give it a spin for about 20 seconds. Add most of the flour and process. The dough should start to come together after a minute or so. Continue to add more flour until the dough comes together in a ball but is still the slightest bit sticky. When the dough is formed, dump it out and pat it into a disc, wrap in plastic wrap, and let it rest for at least an hour. Put the ricotta and bacon in a bowl. Beat the egg separately and then add to ricotta. Mix to combine, then whip vigorously with your spoon for about 30 seconds till the filling fluffs a little bit. 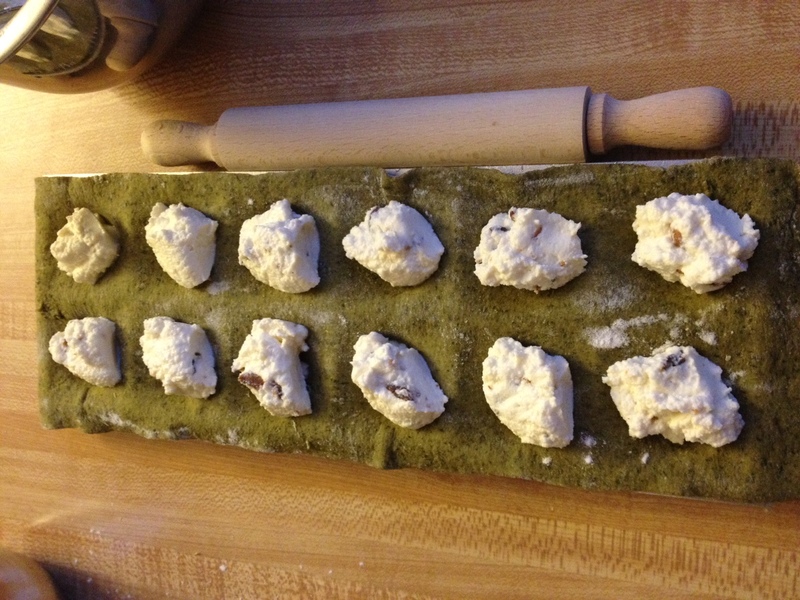 Cut your dough into 6 equal portions and roll out sheets in a pasta machine. They should be as thin as you can get them without tearing. Set each aside in a floured towel. Flour the ravioli and return to the floured towels. Repeat 2. and 3. till you’ve used all of your pasta sheets and filling. You can roll out any scraps of pasta you accumulate along the way to extend your production. Cook as many ravioli as you plan on serving in gently boiling salted water for about 5 minutes till the pasta is cooked through. 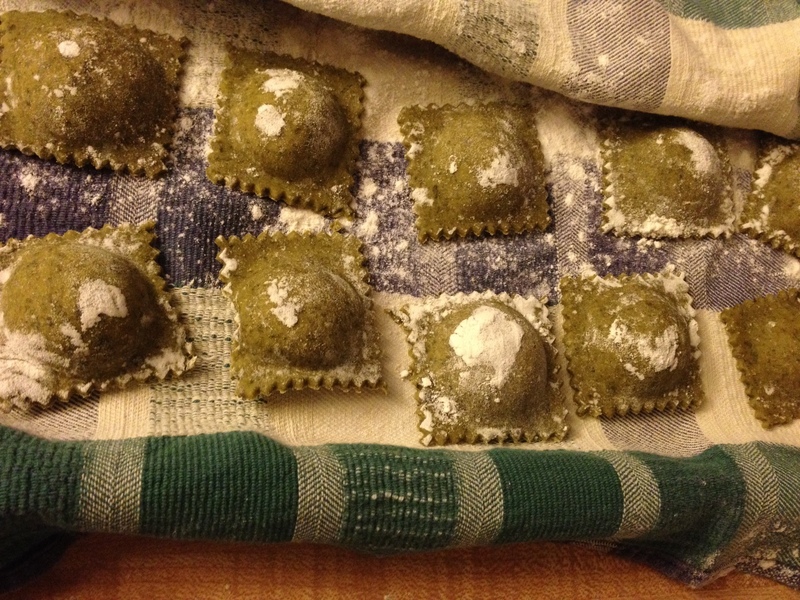 Freeze any leftover, uncooked ravioli.